I just had the craziest experience. Im standing there listening to a pair of Bowers & Wilkins (aka B&W) CCM 818 speakers, hearing the most exquisite soundstage, and able to pinpoint the tiniest details deep in the mix. From the bottom note of a bass guitar to above the range of human hearing, these speakers rock. Except for a fashionable midrange dip, theyre flat as Kansas and clean as rainwater. Whats so crazy about my experience is that the CCM 818s are mounted in the ceiling. Its not that I havent heard some very good ceiling speakers. Ive got Definitive Technology UIW 94/A and SpeakerCraft Aim8 speakers throughout the house, and while theyve always sounded spectacular, the pinpoint imaging I hear from the B&Ws is something new. The two-way CCM 818 ($1600 USD per pair) has the same 8" woven-Kevlar bass/midrange driver that B&W uses in their freestanding 800-series speakers, but here its angled at 12 degrees so that you can aim it at the main listening area -- which is one of the main reasons it can throw such an accurate soundstage. The crossover frequency is 3.5kHz, which means that that 8" driver covers plenty of range, including the fundamentals of most orchestral instruments. The clarity comes from the 25mm aluminum-dome tweeter, housed in a tube that helps control the tweeters backwave and has become a hallmark of B&Ws high-end Nautilus line. The entire package is sturdy enough to withstand the ministrations of your local installer, and simple enough for most of you to make it a DIY project. And the CCM 818 can be painted -- once its in the ceiling, its effectively invisible. Sonically, the pair of them were pretty invisible, too. The men from the local Magnolia store installed my review samples. From unloading their ladders to handing me a ticket, they took about 30 minutes. The only problem they had was in trying to satisfy me that theyd aimed the drivers precisely at my listening area. Otherwise, they probably could have done the job in 15 minutes. My sources included a Rega P-25 turntable with Rega Super Elys Cartridge, an Oppo DV-983H universal disc player, and a Sony PlayStation 3 (for Blu-ray duties). An Integra DTC-9.8 surround-sound processor sent the signals to an Anthem A5 multichannel amplifier, which drove the B&Ws through Monster Clear Jacket speaker cables. I began with a barrage of Kind of Blues released by Columbia: "six-eye" LP (CS 8163), early (CK 8163) and late (CK 64935) CD editions, SACD (CS 64935), and 5.1-channel surround on a DualDisc (CN 90887). All should -- and do -- sound different, but the trick is how well a speaker can reveal those differences. This classic Miles Davis albums sound is of six men in one room playing their asses off, with lots of microphone bleed revealing the sound of the studio as well. While the six-eye sounds the most organic and "in the room," the SACD captures the digital crown. Paul Chambers woody double-bass sound always comes through best from LP, even though Columbias disc-mastering crew was notorious for holding back the bass and the digital engineers supposedly restored it all. Jimmy Cobbs cymbal work on "So What" sounded natural through the B&Ws with all media except the early CD. Daviss trumpet, whether open or muted, hushed or full-throated, had that babys cry that no one has since been able to copy. The B&Ws handled all of this with aplomb, sounding clean and extended while throwing that excellent soundstage. For classical music, I pulled out the best-imaging recording I know, of David Atherton and the London Symphonys performance of William Mathiass Dance Overture (LP, LOiseau Lyre 346; CD, Lyrita 328). The music begins at pp and moves to fff, along the way showing off each orchestral section, and ending with a rousing finale, all in 6:36. The B&Ws soundstaging abilities really shone, with the strings being especially vivid. The CCM 818s properly revealed the difference between the mellow, rosiny sound of the violins on LP vs. the CDs steelier sound. Andrew Litton is one of the few conductors who understands the soul of Sergei Rachmaninoff: He has a wonderful ability to move from heart-wrenching pathos to superhuman aggression, all while resisting any temptation to turn the music into schmaltzy movie music. Littons versions of the piano concertos (SACD, Hyperion SACDA667501/2) set Stephen Houghs piano against the shifting orchestral sections and offer lovely instrumental combinations, all of which were sonically transparent through the B&Ws. This was a hallmark of the CCM 818: clarity and transparency. This speaker didnt sound muffled or fussy, but open and expressive. Steely Dans "Hey Nineteen," from Gaucho (SACD, MCA B0000868-36), revealed a slight bit of compression in the opening salvo, but the sparkling, percussive sound of "Babylon Sisters" came through perfectly. Danny Elfmans score for Mission: Impossible (CD, Point Music 454 525-2) has rollicking percussion and subwoofer-rattling lows, and track 1, "Sleeping Beauty," has all of it. The B&Ws couldnt quite get down into the 20-40Hz region, but everything above that was just fine. And anyway, what ceiling-mounted loudspeaker can go below 40Hz? The bass the B&Ws did reproduce was nimble and expressive, and helped give the performance a proper foundation. Wanting to get an idea of just how loud the CCM 818s would play, I put on New Orders Bizarre Love Triangle (CD, Qwest 20546) and cranked it up to 11. What I could hear through the pain was pristine. I then cranked it back to tolerable levels and was amazed at the tight bass and the panning trickery. 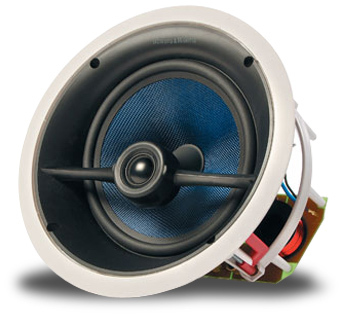 These speakers will play loud enough for most any listener -- a testament to the robustness of their construction. Bottom line: The B&W CCM 818 is oh, so accurate. It would be a pleasure to hear them used for the rear and/or surround channels of a home theater. In fact, the CCM 818 is ideal for those who already own 800-series B&W speakers, because the 818s share drive-units with that line and, thus, a sonic thumbprint as well. I had the review pair installed in the kitchen, where theyll live out their lives -- Im keeping them. The wife and I do lots of cooking, and now that we have high-quality sound in the kitchen, we can chop veggies in rhythm to Beth Orton dance remixes over the CCM 818s. I feel lucky to have them. Price: $1600 USD per pair.